Normally I like to explore common backyard wildlife. But I was recently lucky enough to meet a loggerhead sea turtle as she laid her eggs. For me, this was the treat of a lifetime. And I had to share! This all started when I was a child. I was fascinated by turtles. It didn’t matter the species, I loved them all. I diligently kept a turtle log, recording the scientific data of all the turtles I found. I had a wonderful science teacher who encouraged my love of nature and allowed me to bring turtles into class to show everyone. She even allowed me to collect everyone’s pennies and dimes to scrape enough money together for our class to join a sea turtle rescue. Fast forward to 2015, and I’m still just as excited every time I find a turtle. So, I recently visited the Georgia Sea Turtle Center on Jekyll Island with my family. This wonderful facility handles turtle triage up and down the East coast. The center in itself is a treat. The displays are beautiful and informative. Each visitor gets to follow the trek of a turtle through its life finding out where it goes once it’s hatched and beyond. You can see the rehabilitating sea turtles in their tanks and even observe a feeding. During nesting season, the center offers nighttime hikes to; hopefully, see the females as they come ashore to lay their eggs. Nothing’s guaranteed, but I decided to seize the day and booked my family. We started at the center for a short video then drove to the beach, which was completely dark since no lights are allowed. The guides radioed to the beach turtle patrol to see if there were any spottings. I held my breath because while nest numbers are up this year, there hadn’t been any sightings for the last week. A voice came over the radio confirming a loggerhead was just coming ashore. They gave us the location and we all took off at rapid speed. Once we got there, we could see the beach patrol scientists were with the turtle, but we couldn’t get close. We had to wait until she started to lay her eggs. At that point, the turtles go into a trance-like state and it’s safe to get closer. When I first saw her, I was instantly amazed. She was huge! I had seen loggerheads in aquariums, but nothing compared to on land. The scientists estimated she was over 250 pounds. 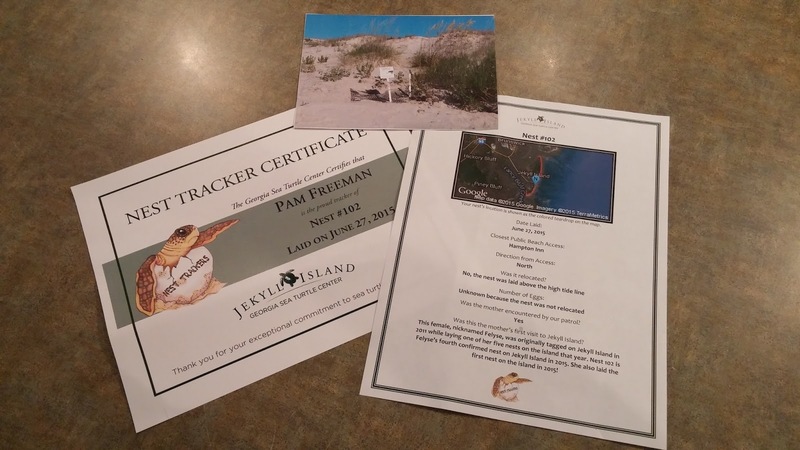 It turns out our turtle was Felyse and the beach patrol was already familiar with her. Our nest was number 102 and Felyse was becoming a frequent visitor. 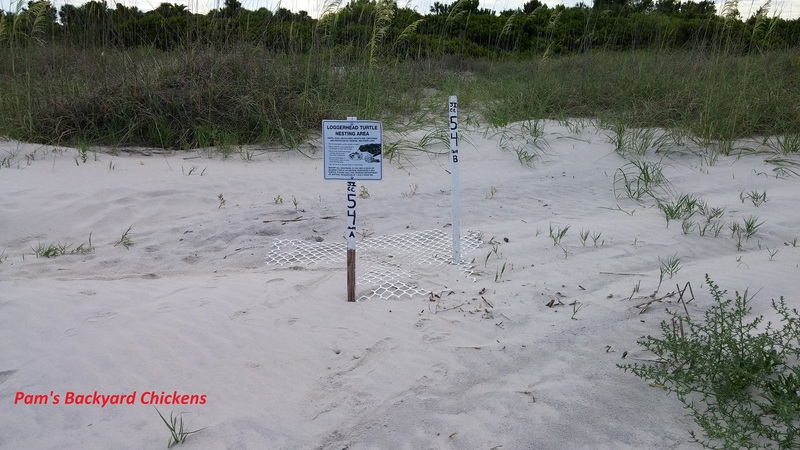 She was the turtle who laid the first nest of the 2015 season on Jekyll Island and this was her fourth nest of the year. Felyse was originally tagged on Jekyll Island in 2011 while laying one of her five nests that year. 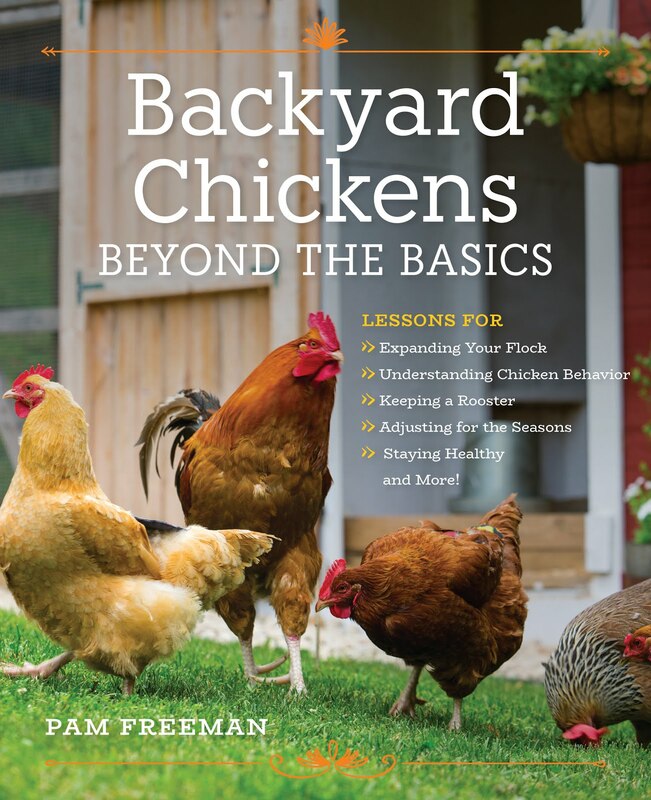 As a backyard chicken owner, I was amazed by this egg laying process. The sea turtle process was so different. Loggerheads don’t start laying until they’re 30 years old and they don’t lay every year. They take a few years off between laying years. Around March, the females mate with the males at sea. 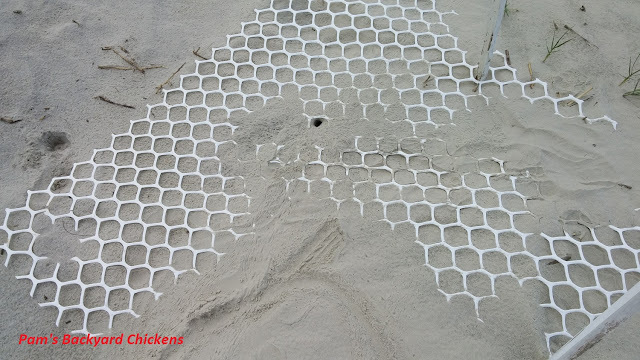 The eggs then start to collect in the turtle. Once enough are collected, about 75 to 150, the females crawl ashore to lay. They go back to sea and more eggs start to collect. It’s different with each turtle, the average is three nests a season laid during two-week intervals. And, interestingly, hatchlings in the same nest can be from different fathers. Once Felyse was done laying, she covered her nest and then we lined the way as she slowly crawled back to the ocean. The turtles get tired during this process, so there’s a lot of starting and stopping. As the waves covered Felyse, I couldn’t help but think how relieved she probably was to be weightless again and swimming. And, I sent her my best wishes. With so many things that could go wrong, from predation to pollution, I wondered if Felyse would ever be back to visit again. I certainly hope so! 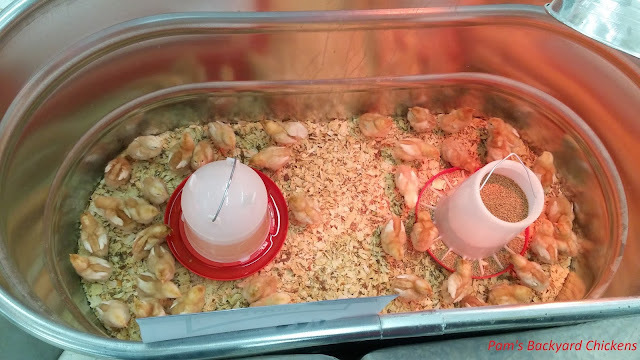 As for her eggs, the hatchlings start to emerge about 57 days after being laid. That means Felyse’s eggs will hatch sometime between mid-August and September. The Georgia Sea Turtle Center does have a nest watcher program where you can sponsor a specific nest. I’ve sponsored Felyse’s nest and I can’t wait until they send pictures of her hatchlings! Then, her story will be complete and I’ll hope that 30 years from now, some of Felyse’s offspring are lucky enough to return to Jekyll Island and start the whole process over again.